MIAMI (AP) Marlins closer Kyle Barraclough was the National League’s best reliever in June, which makes him a trade target in July. The hard-throwing right-hander was chosen NL reliever of the month, an honor that will assume a prominent place in his collection, partly because there’s little competition. As the trade deadline approaches, Barraclough’s recent dominance makes him attractive to contending teams looking to shore up their bullpens. And with the Marlins in a rebuilding mode, they’ll listen to offers. Barraclough allowed one hit in 36 at-bats in June, tossed 12 scoreless innings and converted all seven save chances while the Marlins went 14-14, their best month this season. Barraclough began this week on a streak of 20 2/3 consecutive scoreless innings dating to May 8. He had a .085 batting average against for the season, lowest in the majors. His ERA of 0.99 was fourth-lowest. 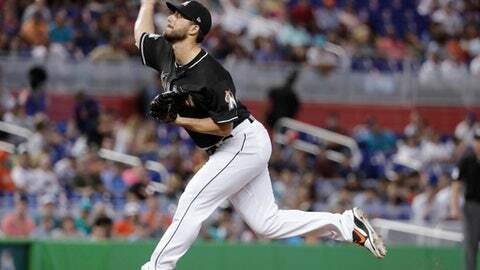 He moved into the closer’s role a month ago for the first time in his career, and the change brought stability to a bullpen that had been one of Miami’s weakest areas. Barraclough has a fastball that clocks in the upper 90s, and in 2016-17 he averaged 12.3 strikeouts per nine innings. His whiffs are down slightly this year, but walks also are down thanks to improved command. The result is more efficient outings. Barraclough’s pitch counts for his June saves, all requiring three outs, were 13, 11, 14, 14, 11, 10, 10.